H2O, +44, The Operation M.D. Lewis accompanied Patty Schemel, drummer for Hole, to a Blondie concert and decided to find musicians to accompany herself and Patty. The Licks became Juliette (vocals), Patty Schemel (drums), Todd Morse (guitar) and Paul Ill (bass). The band released their first EP …Like a Bolt of Lightning in 2004, which was shortly followed by the debut album You're Speaking My Language, whose title track became their most successful single, followed by the less successful, disco-influenced "Got Love to Kill". The released version of the second single was a remix of the original song, which had a more rock influence. Schemel left the band before sessions for the second album had begun, so Foo Fighters frontman Dave Grohl filled the gap. The album was recorded by Lewis, Grohl, Morse, Kemble Walters and Jason Womack. Grohl then asked the Licks to be a guest act at the Foo Fighters' sell-out Hyde Park performance in June 2006, to around 85,000 people (other acts were Angels & Airwaves, Queens of the Stone Age and Motörhead). At the same event, Lewis and Moa Holmsten from Meldrum sang backing vocals on one of Motörhead's songs. Their second album Four on the Floor, was released in late 2006. "Hot Kiss", which was one of the Licks' most successful singles, was the first release from the album, though the following single, "Sticky Honey", proved less commercially successful. The band then toured America and Europe, including opening for Muse and Chris Cornell. Kemble Walters left in 2007 to rejoin his original band, The Rise. The band recruited a temporary player before guitarist Emilio Cueto was recruited to fill the spot permanently. The band performed and presented awards at MTV Brasil's music awards that year, and did the same at the 2008 MTVAAs in Sydney, Australia, after which Todd Morse left the band. Craig Fairbaugh replaced Morse on tour, before the band ceased operations in 2009. In a 2009 MySpace blog, Lewis announced the band was at the "end of its run". 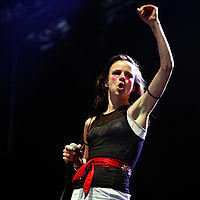 Explaining that she needed a change to grow as an artist, the singer formed a new band and released a studio album called Terra Incognita in 2009. Of the Licks, she said, "There were only two of them left. They split. Nobody wants to tour all the time. I mean, I do, but not them… It looks like the famous singer fired the whole band, but that's not how it happened." ^ Jeffries, David. "Juliette and the Licks". Allmusic. Retrieved March 20, 2015. Janne Hietanen: Juliette and the Licks. Pop-magazine Pop-lehti. Records Collectors Magazine, ISSN 1456-1964, n:o 29 pages 36–37. Wikimedia Commons has media related to Juliette and the Licks.